The language of Assamese is regarded as the lingua franca of the whole northeast India and its history is not been very clearly featured for there are records only dating from the 14th century. The tribes of the Mongolian origin mainly occupy the hilly areas of the state. It was the Ahom dynasty which ruled the area for more than 600 years without any interruption. The Mughal invaders tried to invade this hilly region for more than seventeen times but however it did not work. During this era, the Assamese society was exogenous. It was only in 1824 that the British entered the state for plantation of tea and that's when the destruction of the Ahom dynasty started. During the entry of the British into Assam, immigrants from different parts entered with varying traditional beliefs such as caste system and dowry system. Few of them who liked the place settled in Assam and formed their society strictly adhering to their original traditions. The Assamese are noted for their mixed traditional culture because of the assimilation of various ethno-cultural groups in the past including the local elements and the local elements in Sanskritised forms can be seen. However the Assamese culture is greatly influenced by the Kamarupa Kingdom which had been grouped here for nearly 700 years. This was followed by the Ahom dynasty during the 13th century which reigned for more than 600 years. Another milestone in the culture of the Assamese were the Koch Kingdom (15th–16th century AD) of western Assam and Kachari Kingdom (12th–18th century AD) of central and southern Assam. During the 15th century the great Srimanta Sankardeva (Sonkordeu) and his disciples started a religio-cultural movement namely the Vaishanav Movement, which paved way for another dimension to Assamese culture. Traditions and customs play a significant role in all the societies of a particular group and they form the base for the same. The customs and traditions are more of beliefs which has been followed by earlier generations which are widely accepted and strictly followed. Thus the Assamese also strictly adhere to such customs and traditions generated by their forefathers pertaining to their community. The Assamese weddings, birth, festivals and even death include various customs and traditions which are supposed to be followed. The Assamese are very much attached to the bamboo culture, especially Jaapi which is more commonly known as the sunshade of Assam. This Jaapi or the bamboos are used by the Assamese to welcome special guests. The Jaapi is mainly made of bamboo strips and a kind of dried palm leaves which is locally known as "Tokow Pat". Jaapi has a number of varities like Halua Jaapi, Pitha Jaapi, Sorudoiya Jaapi, Bordoiya Jaapi, Cap, etc.In olden days the Assamese used these Jaapi's for the females of noble and rich families as their headwears.Sometims it is also used in the paddy fields by the peasants as umbrellas. Assamese are known for their traditional crafts which includes Bell and brass metal crafts. Apart from these the Assamese are also noted for their Cane and bamboo craft, silk and cotton weaving, toy and mask making, pottery and terracotta work, wood craft, jewellery making, musical instruments making, etc. They also excel in ivory crafts, colours and paints, articles of lac, agarwood products and traditional building materials. Moreover, various ethno-cultural groups in Assam make different types of cotton garments with unique embroidery designs and wonderful color combinations. The people of Assam are basically rice eaters for they grow different varities of rice. Most of their meal will be complete which includes rice, lentils, fish curry, meat curry, herbs and vegetables. Fish is also eaten in the fried form. Meat dishes include varieties like pork, mutton and birds like ducks and pigeons. 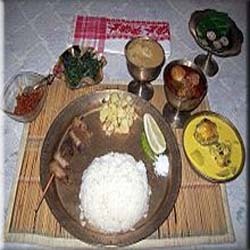 Another favorite combination can be looci (puffed bread), a curry which can be vegetarian or non-vegetarian, and asar (pickle).Any traditional meal of an Assamese will not be complete without Khar and Tenga which is a sour dish.Somtimes for flavor in the curry the bamboo shoots are added. The bamboo shoots are also preserved and made into pickles. The banana flower and its squash is used to prepare tasty sabji's.Utensils made of bell metal is generally used to serve food. Agriculture is the main occupation of the people of Assam. It includes cultivation of various crops like rice, different pulses, jute, tea, fruits, sugarcane, potatoes, cotton, oil seeds, coconut and areca nut. Shifting cultivation is mainly carried out in these hilly areas. The main fruits cultivated here include citrus, bananas, guavas, pineapples and mangoes. The people's revenue is by the forest area. Timber is a major product of the states' extensive forests and bamboo is another product, bringing Assam substantial revenue and adding to its wealth. 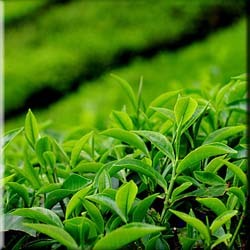 Assam is rightly known for its excellent tea which is one of the major cash crops. Assamese are not only known for the production of silk material but also for weaving. Production of tusser and other silks and weaving of fabrics is an important occupation for a number of people. There are also industries for food and wood products. Dr. Bhupen Hazarika -Living Legend of India in Singing. Pramathesh Barua - Founder of Indian Cinema. Upendranath Brahma -Bodo-Fa, the father of Bodoland. Manmohan Singh - Prime Minister of India. Zubeen Garg -Recent most famous Singer.